The Freemasons-sometimes shortened to Masonry-see themselves as the oldest and largest fraternal organization in the world. They trace the earliest Masonic ideas to the mason workers of Solomon’s Temple in the 5th century BCE and most of their ideals to the free-roaming freemasons of Europe in the 13th century. The Freemasons of today connect with this lengthy lineage by incorporating symbols representing the Temple and masonry tools, such as pillars, checkered floor tiles, and the iconic square and compass. You can learn more about Freemasonry on the official Grand Lodge of California website here. Over its long history, Freemasonry has sprouted countless other organizations, some that reinterpret the symbols, add new ones or are majorly influenced by other cultures. On display, we have items from a number of these groups, including the Free and Accepted Masons, Order of the Eastern Star, the Shriners, and the Knights Templar. 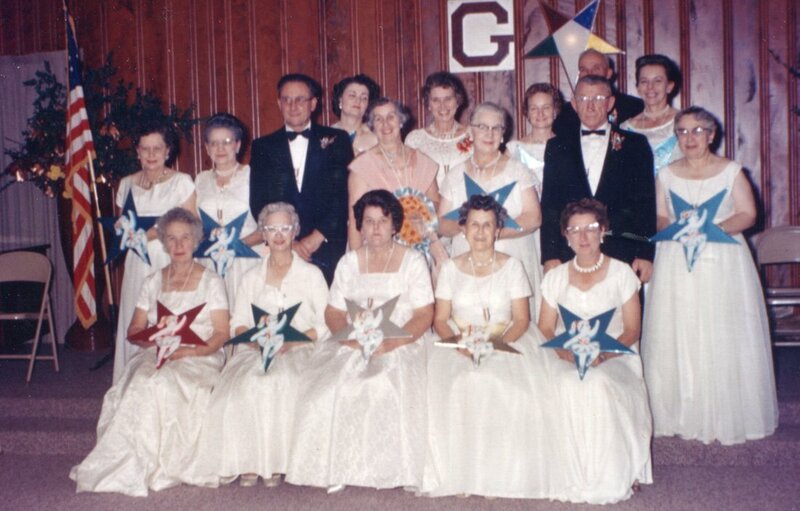 These groups had at least one group within Humboldt County, but many of them had multiple lodges across the county. An appendant or Auxiliary organization is directly connected to another organization by requiring its members to be members-or related to a member- of the parent organization prior to joining. 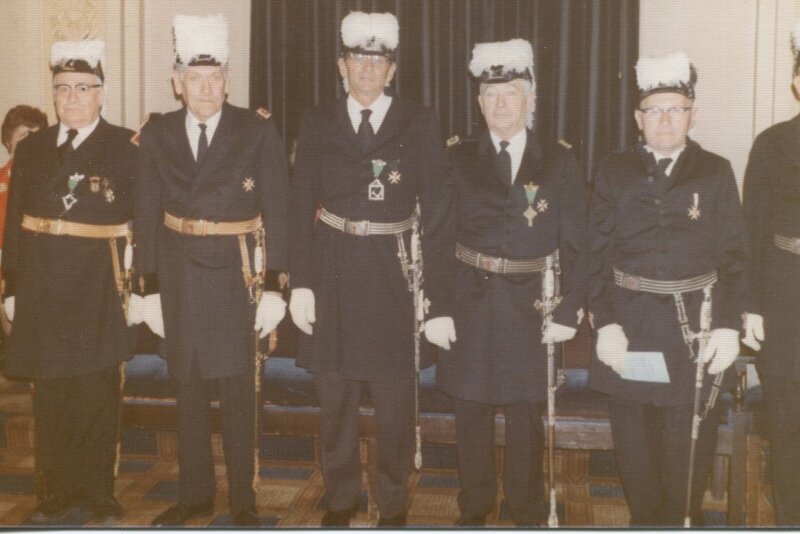 For example, prospective members of the Shriners must first be Master Masons before joining the Shriners. 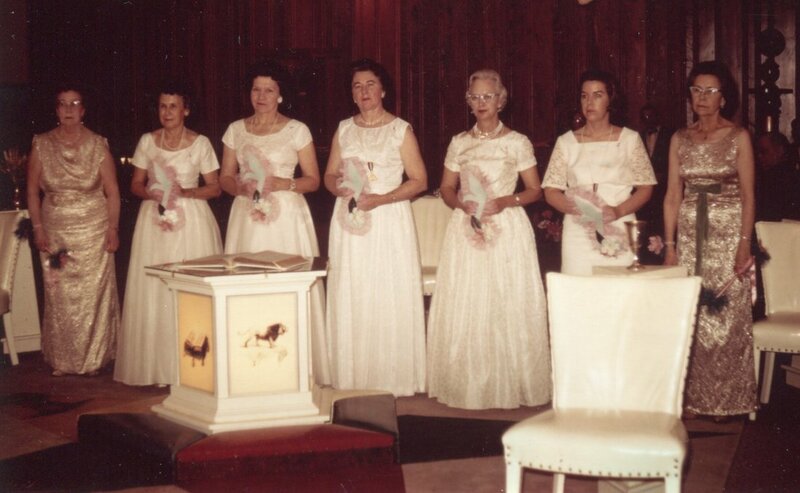 It is notable that the Masonic and related appendant organizations like Job’s Daughters are greatly influenced by the Christian Bible in the organizations language, ritual and costuming. However, Masons do not declare themselves to be a religiously based group and discussions on religion, politics, and business are not allowed at meetings. The development of this organization has largely taken place in a heavily Christian-influenced Europe, which explains the prevalence of these religious symbols in a self-declared secular organization. The Knights Templar, drawing their name from the famous crusading group, is an appendant organization of the Masons where members must not only be Masons but must be Christians as well. Their slogan is In Hoc Signo Vinces, which translates to “In this [sign] you will conquer”. Their symbol includes a cross with a crown, which is a widely used Christian symbol with many different interpretations. Examples of this symbol appear on the Templar's ceremonial swords, as seen below. Detail from a Knights Templar ceremonial sword, courtesy of Bill Kohse. 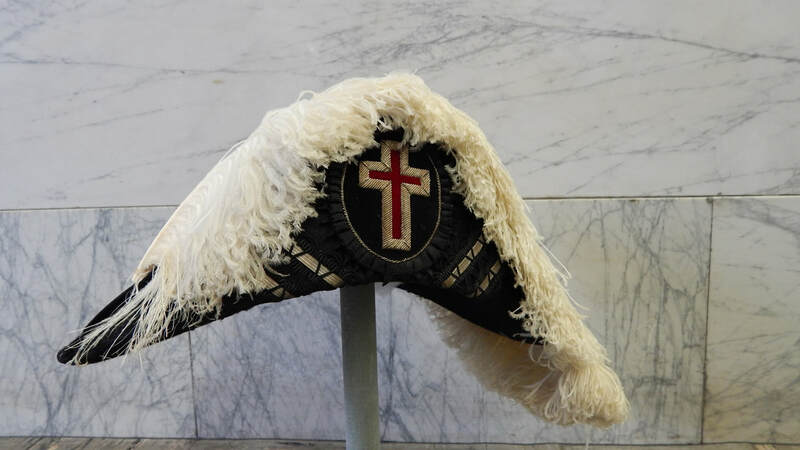 A Knights Templar ceremonial hat, courtesy of Bill Kohse. 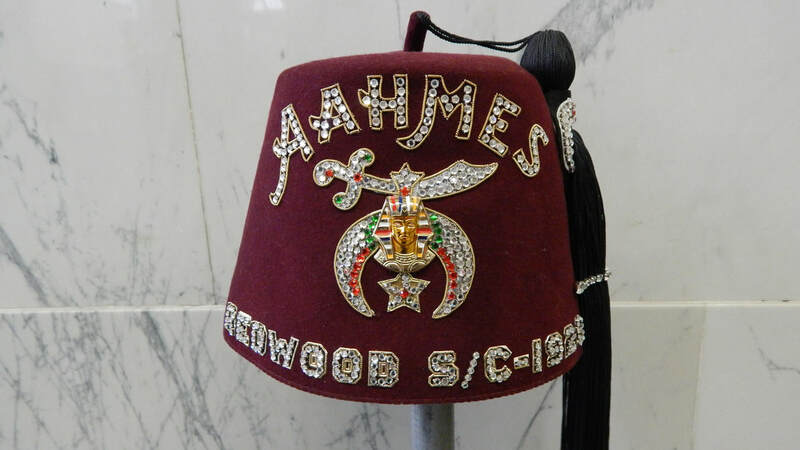 A.A.O.N.M.S., which stands for the Ancient Arabic Order of the Nobles of the Mystic Shrine for North America, is more commonly known as Shriners. It was founded in 1872 as a Masonic fraternity emphasizing fun and is based off an Arabian-based play that ended with all members of the audience being inducted into a secret society. Their symbols, rituals, and greeting are drawn from Middle Eastern cultural traditions, especially Islam. All members are Master Masons, a title received after a series of rituals and increased understanding of Masonic knowledge. Self-declared as the ‘fun branch of Freemasonry’, the Shriners are largely known for their presence in parades, circuses, and their hospitals for children. In Humboldt County, the Shriners have hosted many circus events and had a marching band at one point. They are recognizable by their burgundy Turkish Fez, decorated with rhinestones, the Temple name, and the symbol of the Order: a scimitar, star, and sphinx head. Turkish Fez from the local Redwood Shrine Club. The Ancient Egyptian Order of Sciots, oftentimes shortened to simply to Sciots, was initially founded as an appendant order of the Masons. 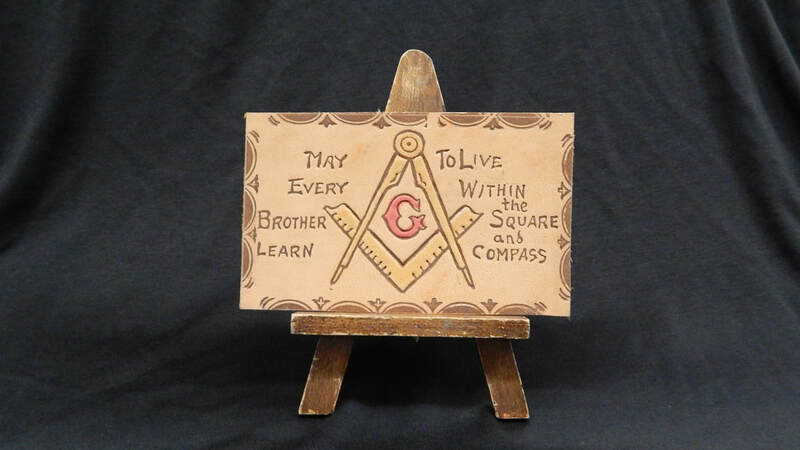 The founders wanted to create a place where Masons could come together without the rigidity of typical Masonic meetings and find more ways to apply many of the Masonic principles to everyday life. In Humboldt County, there was at least one Sciot group, the Eureka Pyramid, and many pictures of the Sciots are of the Sciot Band participating in parades and other social events, oftentimes in absurd costumes. ​Additionally, the symbolism and rituals in the Order of the Eastern Star draw heavily from the Christian Bible by including various female biblical characters such as Ruth, Martha, and Esther and quoting bible verses. However, as with a majority of other Masonic appendant organizations, a belief in a Christian God is not a mandatory requirement to join the Order, only a belief in a Supreme Being.